Palm oil has a pretty bad reputation. The product of this hard-shell red fruit, harvested primarily on plantations in Southeast Asia, is typically used as cheap cooking oil for fried foods like noodles and curry puffs. Indeed, by the time the palm oil is processed, much of its nutritional value is destroyed. And the fact that it can congeal at room temperature makes it even look extra artery clogging. But curry puffs and clogged arteries are only part of the story. Preliminary research suggests that the form of vitamin E packed into the oil-palm fruit, tocotrienol, could help fight cancer and prevent strokes. Though tocotrienols can be found in rice bran, barley and wheat, palm oil is the richest source of tocotrienol, says Pramod Khosla, an associate professor in the department of nutrition at Wayne State University in Detroit. He says numerous test-tube studies done over the past two decades in the U.S., Canada and Malaysia show tocotrienols are "very effective" in killing cancer cells. Now researchers worldwide are embarking on the critical next step: human clinical trials on cancer patients. "The reason the clinical trials are being done is because the preliminary findings are so promising," Khosla says. The payoff from these trials could be big: using a natural food-based compound to prevent or treat cancer and stroke. "The advantage of food compounds is they are natural and safe," says Arthur Ling, CEO of Davos Life Science, a Singapore-based biomedical firm. "They can be part of your daily diet." Unsurprisingly, most of the research on the biomedical promise of palm oil is being done in Southeast Asia, where the product is grown. Davos Life Science, which is owned by Kuala Lumpur Kepong, one of the largest oil-palm plantation companies in Malaysia, is a leader in the field of harvesting tocotrienol from palm oil. 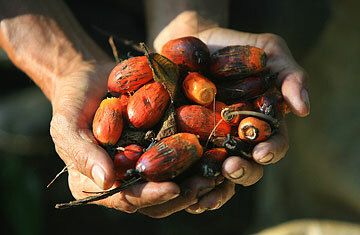 By steaming the oil-palm fruit at high temperatures, its embedded oil leaks out. The nine-year-old Davos Life then extracts tocotrienols from this distilled vitamin-rich liquid. This, in turn, forms the raw material from which supplements are produced. A good way for tocotrienols to be absorbed in the body, researchers say, is through high-dosage health supplements. This June, Davos Life will embark on a human clinical trial involving late-stage prostate-cancer patients at a research hospital in Kuala Lumpur. Over an initial phase of about six months, cancer patients will be administered high levels of tocotrienols under close medical supervision. Davos Life's hope is that by establishing a stronger link between tocotrienols and cancer therapy, even those not suffering from the disease will be encouraged to increase their intake of tocotrienols by either swallowing it through a pill or adding it to processed foods. "If we can show the health benefits of tocotrienol, one can create an additive from it the way it's been done with fish oil," says Ling. "That could be a huge market." The comparison to fish oil, whose cholesterol-lowering omega-3 fatty acids have exploded into a multibillion-dollar food-additive industry, may be more hopeful than realistic. Like fish oil, palm oil contains natural ingredients that are good for you, "but at much lower levels than fish oil," cautions Khosla of Wayne State University. Nor can palm oil be easily swallowed in its raw and red-colored form, the way fish oil can be eaten through fish. "The taste is bitter," according to M.R. Chandran, a retired Kuala Lumpurbased palm-oil-industry executive. The more appropriate comparison, Khosla says, is to olive oil. Like olive oil, raw palm oil comes from a fruit and contains roughly the same amounts of beneficial properties. Nascent though it may be, the promise of tocotrienols in the fight against cancer is gathering force worldwide. So far, much of the research has been preliminary, restricted largely to test tubes in labs, but ongoing human clinical trials are being conducted not only by smaller Southeast Asian outfits like Davos Life but also by scientists at Ohio State University (on stroke prevention). There are more cancer-specific clinical trials being carried out by researchers at the H. Lee Moffitt Cancer Center in Florida and the University of Medicine and Dentistry of New Jersey. Whatever the results of these trials are  analysts and researchers caution that it may take years to achieve a decisive breakthrough  the much derided nutritional image of palm oil is certain to improve. "There has been a stigma attached to palm oil," says Chandran. "That has not been very fair." VIDEO: Indonesia's Palm-Oil Dilemma: Cash In or Fight for the Forests?